Children between the ages of five and nine and men are at the most risk of dog bite-related injuries, and most are bit in the home by dogs that are familiar to them. 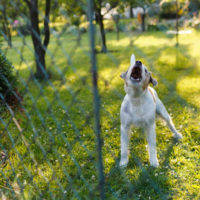 In fact, according to the Centers for Disease Control and Prevention (CDC), families with two or more dogs in their homes are five times more likely to be bitten. Whether you’ve been bitten by your own dog, someone else’s, or a stray, you need to take specific steps immediately to reduce the chance of infection. Avoid approaching unfamiliar dogs, running from them, making loud noises, disturbing them while they are eating, encouraging them to play aggressively, and letting small children play with dogs unsupervised. Try to ascertain whether the dog is up-to-date on its rabies vaccinations. Tetanus: can be a problem in deep bite wounds and cause rigid paralysis. If you have been injured by a dog bite, you may be entitled to compensation to cover medical expenses, lost wages, lost earning capacity, any pain and suffering, and any additional trauma if there is permanent scarring involved. At Friedland & Associates, we aggressively represent victims of dog bite attacks. Contact our Fort Lauderdale dog bite & animal attack lawyers today to find out how we can help you.